Halloween is my favorite holiday. I love everything about it: scary witches, ghoulish ghosts, dressing up in costumes, and gorging on tons of candy! As the day gets closer and closer, I like to get in the Halloween spirit by watching some festive movies. Despite my love for horror movies, you will not find a single scary movie on my Must Watch Halloween list! This selection is for both the brave and faint at heart. Pop some popcorn, throw in some candy corn and pour yourself a glass of bubbly (champagne pairs well with candy corn). Then pick a movie from my must watch Halloween movie lineup. Back in junior high I thought Max (the male lead) was hot stuff, now I think his Dad is the good looking one. Sign of getting older? Either way, if you have never seen it, add it to your list. Sarah Jessica Parker, Bette Midler, and Kathy Najimy are amazing as the Sanderson Sisters, and you will be singing "I Put A Spell On You" for at least a week. So catchy! Quick Synopsis: This Disney classic is about three witches who are reincarnated in present day (well, the 90s) Salem on Halloween night. It is up to three kids and a talking cat to keep the witches from killing all the children in Salem. Yes, there is a Mary Kate & Ashley movie on my list. No, I am not ashamed. This movie is da bomb! I know some of you might be thinking why is this on here? But, that Halloween feast in HP1 is too incredible not to have it on the must watch list. HP is great all year long. Quick Synopsis: (If you need this, I fear you have been living under a rock) A young boy discovers that he is a wizard and embarks on a year of adventure and discovery at Hogwarts School of Witchcraft and Wizardry. Another story about a young witch and her self growth while away at school. I feel like this movie is the diamond in the rough. Few people have heard about it, but you will be so happy you watched it! The lead actress is the girl from The Craft (another great movie) but way before that movie was filmed. I love all the Charlie Brown holiday specials. But, I always feel so bad for Charlie Brown especially in this one when he gets a rock at every house during trick-or-treat. Poor guy! Even though I own all the CB classics on DVD, I like to watch them when they come on TV. It makes it feel even more like the holidays. Quick Synopsis: All the gang goes trick-or-treating while Linus waits for the Great Pumpkin. My sister and I watched this movie all the time when growing up. We would sing the songs (it is pretty much a musical) and wish we could dress as cool Louise (mind you it takes place in the 80s). It isn't about Halloween, but she is a witch so it works for my list. Plus it has good underlying message for girls to love who they are. Quick Synopsis: Louise is in high school and not popular. Then she learns that her ancestors were witches and she has inherited their powers. She begins to use them to gain popularity but later questions if it is truly what she wants. Growing up, I checked this movie out every time I went to our local video store. I loved it! I would practice slaying vampires with my hairbrush. Guess I was always meant to be on Team Jacob. Quick Synopsis: A high school cheerleader finds out she is destined to battle vampires. I watched this movie while I made this list and graphic. Like Worst Witch and HP, it takes across the pond in England. Love me some British movies :) You will recognize a lot of people including Mr. Carson from Downton Abbey. Quick Synopsis: A young boy and his grandmother vacation at a hotel that happens to be hosting a witches convention. The witches are plotting to rid the world of children and the young boy must stop them before it is too late! I remember watching this every year on the Disney channel. It is a short, classic that is probably the spookiest movie on this list. The disk comes with another cartoon on it as well, but I only think of the Ichabod as the relevant one. Quick Synopsis: The animated version of the "The Legend of Sleepy Hollow". And there you have it! My list of must see Halloween movies. I am currently working my way through the list and enjoying every magical moment. Witch Which is your favorite? My favorite is Hocus Pocus, but Casper is also a classic! What about the Nightmare Before Christmas? Or Edward Scissorhands? What about Practical Magic or Buffy the Vampire Slayer? 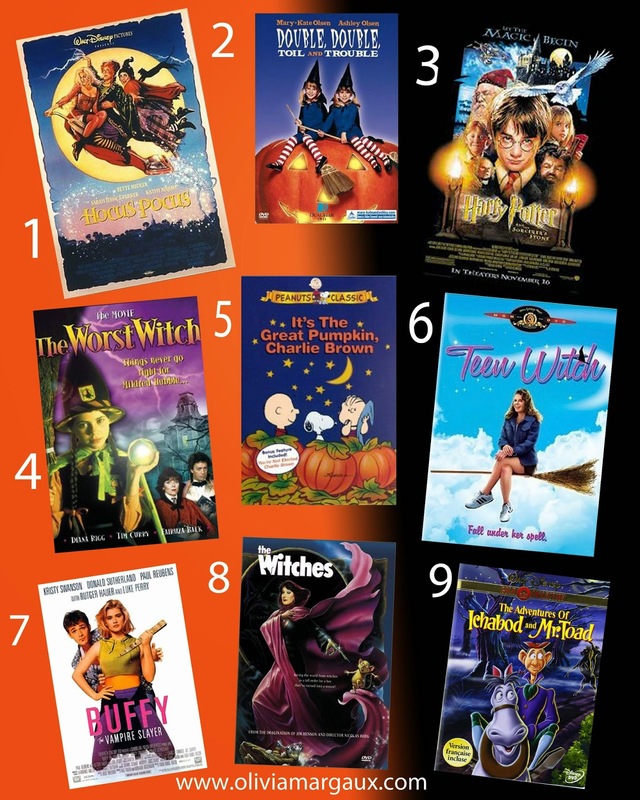 I think Teen Witch is my fav!